Are you seeking a homemade squirrel repellent to fend off squirrels from your bird feeders, garden plants, or yard? There are several commercial repellents available, and you can even mix up a safe and effective repellent at home. 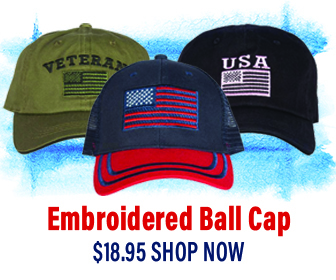 But you may want to try some other effective options first. While this article offers a squirrel repellent “recipe,” your best bet for a positive outcome is to address the root of the conflict. 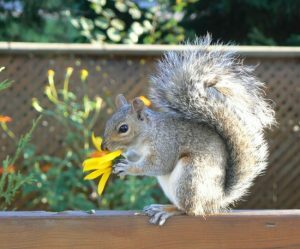 Read on for some helpful tips on how to rein in unwelcome squirrel activities in your yard and garden. Opt for foods less favored by squirrels: Peanuts, peanut butter, and sunflower seeds are all great temptations for squirrels. On the other hand, safflower seed and nyger or thistle seed are much less appealing to them, yet cardinals, titmice, house finches, nuthatches, and doves enjoy them. Alternatively, consider setting up a feeding station that is just for squirrels to encourage them to leave the bird seed for the birds. Choose birdfeeders designed to exclude squirrels: Some birdfeeders exclude by closing off feed ports when an animal weighing more than a typical songbird steps on the feeding platform; some limit access with a spinning action that harmlessly deposits the squirrel back on the ground; and some simply have tiny feed ports that are only accessible by small bird bills. Set up a tray to catch falling seed, or keep the ground below feeders clean: This makes the seed less easily available to squirrels, making them less interested in the feeders. It also reduces an attractant for mice and rats. 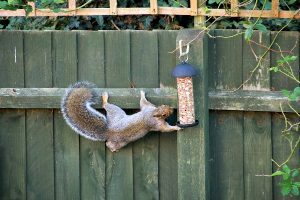 Place feeders strategically and protect them with baffles: Place feeders on poles ten feet or more from trees or other places from which a squirrel might leap and five or six feet above ground. Add stovepipe baffles to the poles, which can either be purchased ready-made or assembled from parts available at your hardware or home improvement store. Install “hat” style baffles above feeders: These plastic domes prevent squirrels from getting to the feeder from above, while also protecting the seed a bit from rain and snow. 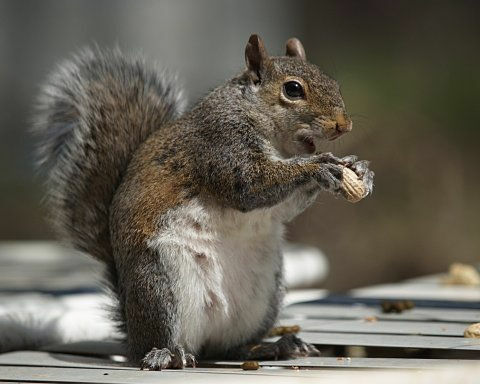 Squirrels add a lot of bushy-tailed charm and interest to your surroundings with their playful antics. But they sometimes get themselves into trouble when messing with lawns—digging tiny holes in which to bury acorns for later, for example. Know that this type of damage won’t hurt the lawn, it’s just cosmetic damage. To discourage this activity, however, you can install motion-activated water sprayers. Squirrels won’t like getting sprayed with water, yet it is not harmful to either them or non-target animals. If squirrels are damaging smaller plantings, , try covering them with garden netting. Likewise, when squirrels decide to chow down on your carefully nursed tomatoes and other veggies, it’s not always easy to look the other way. But keep in mind the fact that they really are not going to take much. If their “take” approaches an unacceptable level, though, protect your plantings with garden netting, and, perhaps, with a wire hardware cloth perimeter. Bulbs can be protected with bulb cages or a layer of hardware cloth (with one-inch openings) placed over them, or with various commercial repellents. A repellent called Hinder can be used on garden vegetables. Peel and finely chop a couple jalapeno peppers. Stir the chopped mixture into about a quart of water and bring to a boil. Simmer for about 20 minutes, then, allow the mixture to cool. Pour the liquid in the bowl through a funnel into a spray bottle if you want to treat plants. Plan to spray the plants once a week and after heavy rains. Setting aside the idea of using a squirrel repellent, though, and using only a combination of the relevant aforementioned approaches to let squirrels know their activities are not entirely welcome, you can truly minimize the squirrel activities that annoy you, while not causing them any real harm to them. Once you feel your birdseed, lawn, and veggies are somewhat protected, you can enjoy watching your neighborhood squirrels again as they feed and play, a small but helpful distance away.